And a holiday packed with very merry news! Admittedly, I've never been too much of a fan of the traditional carols. Some hoppin' "Jingle-Drop Rock", an epic piece of "Carol of the Cogs" -- and my personal favorite, "Rolling Away the Christmas Tree" -- now that's my style. Oh, that wasn't a typo. I really did mean "Rolling Away" the Christmas Tree, not "Rocking Around". Part of my Toon Trooperly duties again this year was to set up the Christmas decorations and lights all around Toontown, and boy was that a blast. Today is the first day of Hanukkah, the holiday of lights, after all. Walt only knows why they'd allow me to do it again after the Great Blizzard of '02, but what can I say? I'm a natural at exterior design. Now, although we needed lights, I certainly wasn't going to give in and buy any! Sadly, the Brrrgh's heating system was strictly off limits this year. Not like that would stop me, but they protected that thing pretty well since last year. Barbed wire, electric fences, and the worst of all: warning tape. There was no getting through it. Luckily, I stopped by my pal Hawkheart's estate to help him load up the prized Christmas tree he has been growing, and in that instant I conjured up a plan. I loosened up an end of the rope tying in the tree onto his kart, so right when he moved forward that thing went rolling away! Away to the tree I flew like a flash, jumped on top of it and started a pretty quick dash. It plowed through the street leading to Hawkheart's estate, wrapping up all of the lamp posts and lights along with it. They're perfect decorations! Sure, those lamp posts were probably there to serve as... Well, lamp posts, but it's not like we ever use them. Really, when was the last time it got dark around here? Oh, hey there Hawkheart. Heh. Well, I better run. Literally! 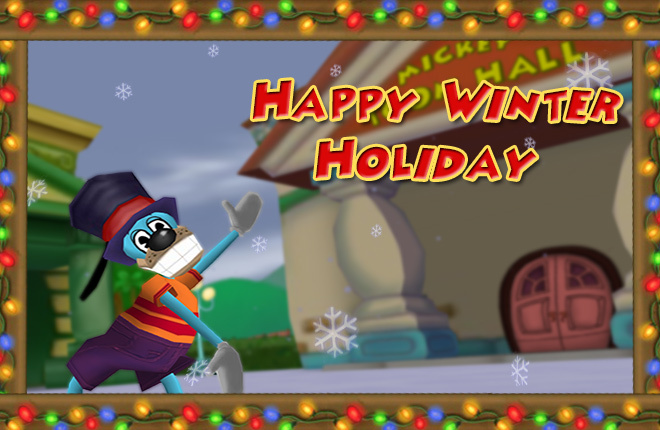 See you soon, Toons, and have a great Winter Holiday! • Fix a crash relating to the friend manager. • Fix the "Last Seen" field on the Toon Detail Panel to display the proper date. • Add a holiday look and theme song to the Pick-a-Toon. 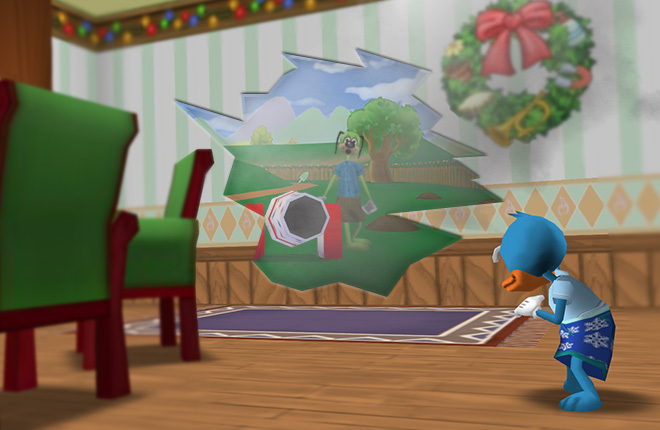 • The Twelve Days of Toontown has begun! Check the blog every day for new events leading up to the most festive finale yet. Happy winter holidays to everyone! Oh no! Don't arrest Sir Max! Have a great winter holiday too, Sir Max! I can't wait to see the Christmas Tree! Ty for the Christmas lights and the HUGE Christmas Tree! P.S. I love the photo from yesterday and today!! Merry Christmas!! Merry Christmas Sir Max =) Hope you get away from Hawkheart! I will enjoy listening to the holiday theme whenever I log in. Gotta keep in spirit ffor Christmas ya know. Merry Christmas, toons! Give the cogs a taste of their own merry medicine and bring good cartoony cheer! Glad to get my laff point back. Well, looks like Sir Max is at it again. and a bit there and...- Oh, hi. I'm just finishing my fan-art of the Christmas Tree in Toontown Central. I think it's a nice addition for the holidays. Anyways, Stay Toony, and have a Merry Christmas! So excited for TTR's Christmas!!!!! Brrrrgh... am I the only one cold here? Sounds pretty good, I can't wait to start playing around in beta 1.7.3. And when the game goes public, I can't wait to say "I helped test Toontown Rewritten!" Christmas will be even more 'Jolly' with this decoration for the one and only ToonTown Central. 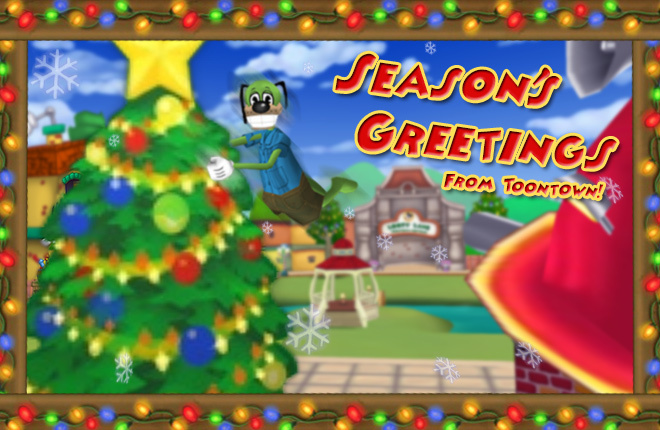 Merry Christmas to all Toons in Toontown! Make sure to lock your doors from those pesky cogs! everybody have a great holiday season!!! Yay! Thanks for restoring my laff point! Now I have 104 laff like I should have had! Thanks TTR! Wonder what the last gift will be... maybe BBHQ? Ho Ho Ho! Merry toonmas! Goodness! I better get Christmas shopping, and fast! Looking good guys :) Great work on all the decorations. Merry Christmas and Happy Holidays all. OMG! 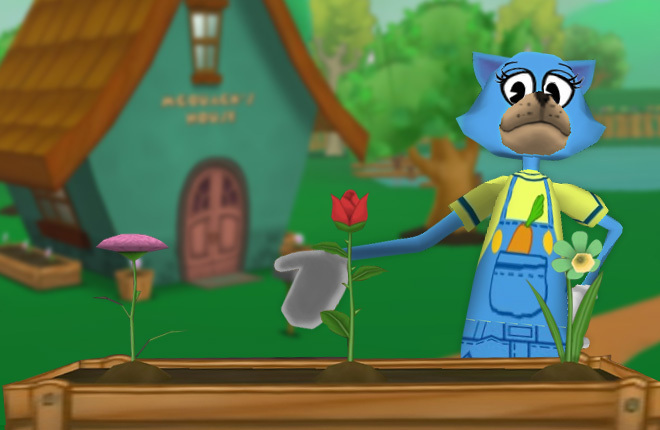 Thanks for doing this TTR! Merry Christmas everyone!!!! I LOVE CAROLING! i played the original toontown, and it been soo long i forgot how to carol.. I can't wait to see tomorrow's update!! 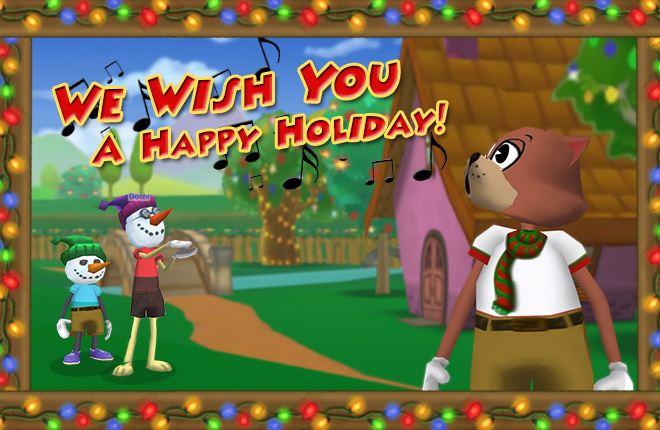 Have a toontastic winter holidays everyone! Woo! I saw the tree yesterday!!!! It was great!!! I love the christmas tree in TTC, its a lovely addition to the game! Oh, Sir Max! :) Happy Holidays, everyone! happy holidays to you and to everyone! A CHRISTMAS TREE! That is awesome!! T-T-T-T-Thats a-a-a v-v-v-very nice t-t-tree standing that ToonTown Central of y-y-y-yours. Toontown's Twelve Days of Winter!